Earlier this season I took a look at Josh Norman’s performance versus Cowboys’ Dez Bryant. In that breakdown, Norman allowed 2 receptions for a total of 16 yards with only 6 of those yards coming from Dez Bryant. The other 10 came from Cole Beasley. In this game, Norman faced another NFC East star wide receiver in Odell Beckham Jr. On the day, Norman was targeted six times, and he allowed Beckham to record three catches for 22 yards and the game-tying touchdown. When the designated #1 wide receiver lined up in the slot, Norman elected to play the outside receiver instead. The Panthers play a wide mix of coverages using Norman underneath as a zone defender in a Cover 2 shell, while also as a deep defender in a Cover 3 or Cover 4 look. Norman’s position is defined pre-motion on the field. What this means is that if the #1 receiver shifts from the slot to the outside receiver position on the far side of the field, Norman does not follow him. Please click here if you want to read that breakdown as a primer. If not, let’s take a look at the results of all ten of Beckham’s targets. *In addition to the above stats, Beckham also had four penalties including one offensive pass interference and three unnecessary roughness penalties. We are going to start this breakdown by first looking at Beckham’s final three receptions in his 8th, 9th, and 10th targets. Note: The play numbers below correspond to the targets in the table above. The Giants line up in shotgun slot right far with Beckham as the outside right receiver. The Panthers counter with four defensive lineman on the line of scrimmage and drop into a Cover 4 shell with three underneath zones. The Giants run a slant-flare concept on the right side of the field. Norman lines up directly across from Beckham on the bottom of your screen, but after the snap he bails backwards immediately into his outside deep zone responsibilities. Beckham runs his slant into the soft spot between the linebacker and the two zones on the right for an 8 yard gain on first down. Why am I showing this play? To illustrate that good play calls and execution by the quarterback and the wide receiver can create holes in any defense. In my opinion, Coleman is late in identifying the underneath route concepts, which is why Beckham had so much space to work with behind the linebacker. But again, it was a quick recognition and clean throw by Manning. This is a great example of Norman’s coverage rule #1 above – Norman does not play slot cornerback – which results in the 40 yard play to Beckham. Norman initially lines up versus Beckham, but since Beckham motions inside pre-snap, Norman continues to cover the outside receiver. After the snap, Beckham runs a drag route underneath the Panthers’ Cover 2 man defense. Cortland Finnegan is tasked with covering Beckham and simply cannot stick with the speedy receiver as he sprints across the field. Frankly, this is a tough task for any cornerback in the NFL. Manning hits his receiver in-stride allowing him to break free up the sideline and cut back inside for a 40 yard gain not before making three defenders miss. 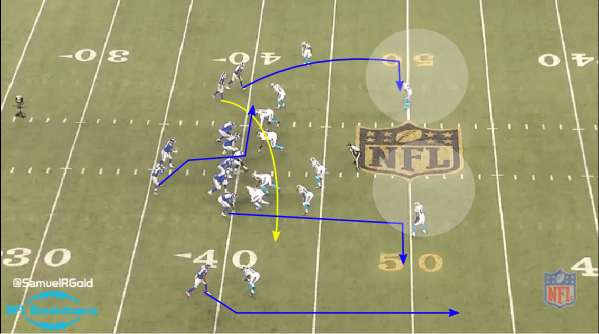 The Panthers play Cover 2 using their cornerbacks in man-to-man coverage while only rushing four. The Giants are in shotgun slot left near with Beckham at the top of your screen. Beckham runs a double-move slant-n-go with an outside release towards the endzone. Norman does a great job initially of sticking to Beckham, but around the 6-yard line things get interesting. Beckham extends his inside (right) arm, which stops Norman’s pursuit towards the endzone. This is a classic “veteran shove.” Is this a penalty? I don’t think so. Between the 8- and 6- yard line, the two were clearly handfighting. Norman was attempting to slow Beckham down by extending his arms towards the receiver, while Beckham was trying to maintain his spacing. In my opinion, this is a good no call by the refs. Manning releases the ball to Beckham who catches the slightly under-lofted throw for the touchdown. These three plays above might paint the picture of a great game by Beckham…but it was actually far from that. In the first quarter, Beckham dropped two passes including Target #2, a 52 yard touchdown pass that was perfectly placed by Eli Manning. You could not have asked for a better thrown ball. How did he get so wide open? Elite route-running is the answer. This caused Norman to look to Manning expecting the throw which is what caused the busted coverage. At the top of his stem, Beckham cuts outside, and then back up the field on his post-route. Later in the first, Beckham runs an excellent out-route (Target #3), which leaves him open by the sidelne. He does an excellent job of coming back for the ball, but he can’t hang onto the ball for the first down. Continue onto the next page for the Giants’ missed opportunities, and a couple (more) mistakes by Josh Norman in the game. Sam founded NFL Breakdowns after working his way through the journalist farm system and is enjoying life in the big league. Growing up outside of Washington, D.C., Sam didn’t choose the Redskins, the Redskins chose him. Out of a love for the game and an insatiable curiosity to determine why his beloved team was underperforming, Sam turned to studying film in NFL Breakdowns.